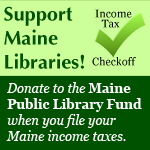 The Library has an informal policy that we close when the Vassalboro Community School cancels for a snow day. Looks like we have some wicked weather headed our way for Wednesday! Please check to make sure we are open before heading out into bad weather. We advertise snow cancellations on WMTW Channel 8, WGME Channel 13, and WCSH Channel 6 as well as on this website and our FB page. Check for updates and be safe! Thank you! Click the link above to access Marvel! "Where You Are Always Welcome!" WHAT: Great books, treats & goodies for a great cause! WHAT: Dozens of great deals and offerings from local businesses, all to benefit the library.